Your front door may very well be the centerpiece of your home’s exterior, so it makes sense that you want to take good care of it. After all, the front door is in charge of making first impressions. So, when it comes time to refinish its exterior, here’s the right way to do it. 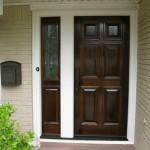 Most people will want to go with a stain that most closely resembles their door’s original look. However, if you’ve recently changed the doorframe or painted your home, perhaps you’d like to go with something different. By picking a stain that most closely resembles its current color, though, you can restore it to its original luster. Before you can approach the project of refinishing your front door, you absolutely have to start by assessing the door itself. Over time, all kinds of factors can lead to changing the physical makeup of a door and if you’re not aware of its current status before you begin, trying to refinish it will probably end up making matters much worse. Harsh weather conditions are generally going to be the biggest factor at play here, meaning you might see splits in panels and swelling or shrinkage that caused the corner edges to pull apart. A lot of doors simply need to be sanded down if they were left without maintenance for an extended period of time. Other doors will actually need to be completely stripped before the refinishing process can begin in earnest. If you’re dealing with a door that has zero overhang and thus faces the full brunt of the sun’s rays, you should expect to find coinciding damage. This means stripping it will almost always be necessary. Next, you’ll want to focus on any buildup that may be plaguing your door due to outside elements. First remove the lockset on your door (this includes the knob), so you only have the basic wood component left. Then use mineral spirits to wipe down the entire exterior of the door. You won’t need to worry about the internal side because the elements will not have made it to them. By now you may have noticed issues with the miter joints, splits, seams, nail holes, etc. If you have, take a moment to apply putty and caulk as necessary to these areas before we proceed. The last step in addressing the physical shape of the door is to sand it down. You’ll want to do this even if you didn’t find it necessary to apply any putty or caulk. This process should involve lightly going over the surface with a sponge sander, then a vibrating sander. You’ll also want to go after any raised molding with crunched up sandpaper. A random-orbit sander will make this step go a lot quicker without sacrificing quality. 80-grit should do just fine. As you go through the above steps, you may want to move up to 100-grit and then 120-grit. However, after that, your sandpapering becomes counterproductive. Anything finer and you’ll actually be closing the wood’s pores which will come back to bite you when the finish isn’t able to adhere to the surface. Now comes the easy part. Prime the door and apply your stain. Generally, two coats are considered best. When those both dry, mix a bit of stain with marine varnish to finish off the project with extra protection so all your hard work will last. When your last coat has dried, you have officially refinished your front door. Reconnect it to the house and stand back to enjoy your handiwork. Of course, if you’d like help with any of this, give us a call at Doors of Elegance. Our Door Refinishing Service includes painting, varnishing and staining that will help faded doors look as good as new. We offer this service on both sides of the lake, from metro New Orleans to Mandeville and the entire Northshore. We’ve done this same process countless times before and can save you time and money. Call today to learn more, (504) 887-5440.